No visit to a German small town is complete without being invited over to someone’s house for “Kaffee und Kuchen,” or in this case, “Zweite Fruhstueck.” (Second Breakfast) When we met Frau Probst out on the Steigstrasse, she said “come back to my house after you see the church and you can join us for coffee and cake.” Naturally, when you’re invited to someone’s house in Germany it’s a high honor and one which cannot be turned down! So at 10:45 we arrived back on the Steigstrasse and Frau Probst was out on the street, smiling broadly and showing Jim where to park the van. We were ushered upstairs to their sunny dining room, facing the pasture outside where horses were grazing. Home-made apricot and apple cakes were offered along with coffee. (Jim and Bill each had two pieces) Herr Probst joined us and we chatted for an hour about their visit to Northeastern America a number of years ago, their experiences in Boston and New York City and the fact that Herr Probst would like to go and live in NYC for “at least seven or eight months,” a prospect that has Frau Probst not too excited. Herr Probst proudly showed a portrait of an attractive young lady. “This is my angel,” he said. The girl was born in America but her parents are lifetime friends of the Probsts, former tenants who rented a house in Mainz from the family back when the husband was stationed nearby. 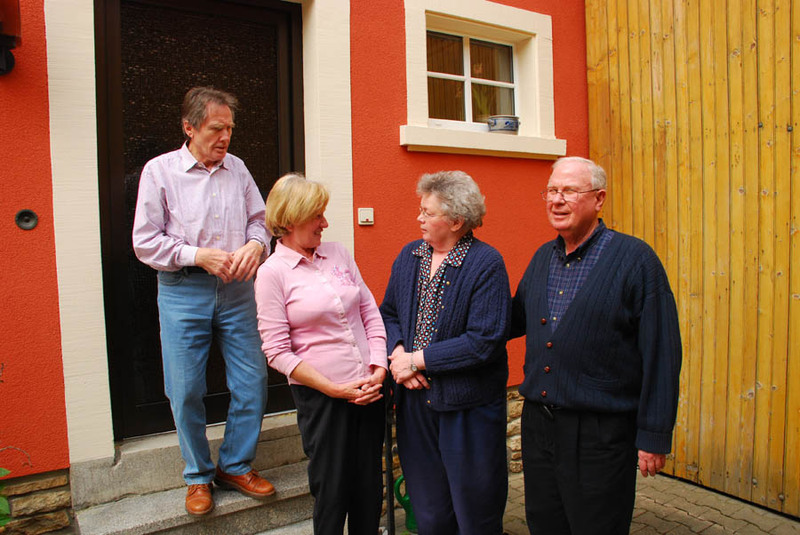 The family has visited the Probsts, and Stetten, 17 times in the last 22 years. 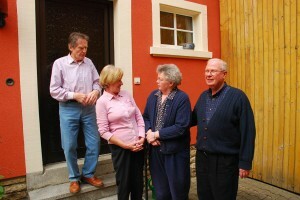 Posted in Family History Tours, Private Tours in Europe and tagged stetten.